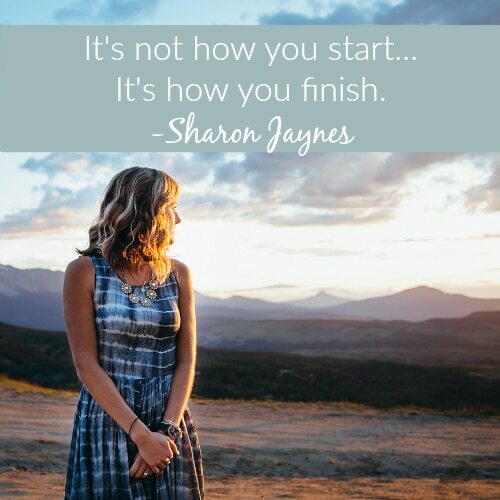 What is one thing you can do to begin to finish well today? Do you long to sense God’s presence this summer? Do you want something more in your relationship with Him? I know what it feels like to have that “glory ache”–a longing to experience God’s presence on a daily basis. I also know ho w easily busyness can get in the way of that. 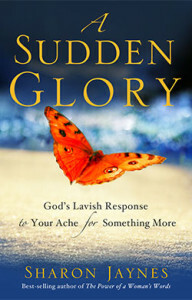 Join me in A Sudden Glory: God’s Lavish Response to Your Ache for Something More to discover how to hear God among the noise of the world, see God among the blur of life, and sense His majesty among the mundane. This was mom’s favorite book! Thank you for sharing your story. Praying that you will feel Gods arms as He wraps them around you. I know he is there because “God is close to the broken hearted” psalm 35:18. Your words are inspiring. It’s just exactly eight years my dad passed to glory.what a coincident! My deep condolences to you Sharon as you await your Mothers passing. I’m so glad she is finishing well. I too want to finish well. Bless you for all the ways your words and devotions have blessed so many. Sharon, You spoke to me through these words. I am sorry that you lost your mother. My mother is still living although she is slowly becoming more frail. I cherish every day with her. Thank you for sharing the great pain of your loss. May God continue to comfort you through His love as you walk through grief. i am so sorry to hear about the passing of your mom…it’s hard, no matter how old we are. may you be comforted with the fact she is now in the presence of Jesus…and you will see her again. May God’s Grace always be with you. God,s Grace is sufficient and I bought this book several years ago and it is MY FAVORITE and since reading this book. I HAVE FOUND SO MANY GLORY MOMENTS IN MY LIFE THAT OTHERWISE I WOULD HAVE MISSED IF I HAD NOT READ YOUR BOOK!!! You are my Favorite Author Ever.. May God bless you and I looked forward to hearing more from you in the future!!! You are so kind. Thank you for the encouragement today!!!! God Bless you. You have helped me to draw closer to the Lord Again ..Thank you. For that. On bended knee and in His grip.!! !